SPARK Museum of Electrical Invention offers docent-guided tours to groups of 12 or more people. Tour groups visiting our science and history Museum will see the collection and hear fascinating stories from a knowledgeable guide. Groups — families, students, senior travelers — will also have the opportunity to experience our hands-on interactive exhibits and, optionally, attend a MegaZapper Show. SPARK Museum has a signature show that you’ll get to see live and in person! This option is great for groups of 12 or more who visit our downtown Bellingham during normal Museum hours during the week. Elements of the show include a variety of eye-popping machines reminiscent of Frankenstein’s laboratory. The centerpiece is a fantastic “Cage of Doom” designed and built by world-renowned sculptor Ric Allen. 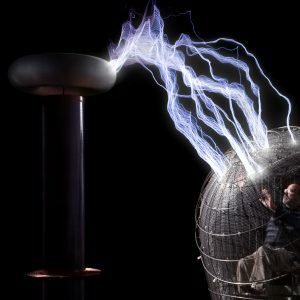 At the end of the show, up to three audience members (aged 18+) are invited to enter the Cage of Doom, where they will be bombarded with 4.5 million volts of electrical potential blasting out of one of the largest Tesla coils in the country! After the show, guests are encouraged to explore our historical and interactive exhibits. From ages 5 to 105, this is science and history everyone can appreciate and enjoy. Experience a docent-guided tour that will amaze and inspire; gallery tours are guaranteed to provide your group with a rare and memorable experience. Your guided museum tour will include viewing demonstrations of early electrical devices, visiting our static electricity lab, exploring Edison cylinder phonographs, trying your hand (literally!) at playing vintage electronic musical instruments, and even seeing a Tesla coil in action. Available only Wednesday through Friday. If you want the best of both worlds, we can make that happen! Groups can book a SPARK Museum experience that includes guided docent tours and a private MegaZapper electrical show. Knowledgeable docents will focus the tours on specified artifacts or collections, which may include the static lab, Edison cylinders, musical instrument history, motors, batteries, or any number of other exhibits.